Recruit new members for the Blades. Locate and bring three suitable followers to Delphine. Induct these followers into the Blades. Ask Esbern about dragon lairs to start the repeatable quest Dragon Hunting. After completing Alduin's Wall, you may notice that the Blades' mission of ridding Skyrim of dragons may be rather daunting for just two people. Ask Delphine about her apparent staffing shortage and she will reply, "The Thalmor hunted us down, remember? It wasn't exactly great for recruitment. But we have a headquarters of a sort now. We'll rebuild the Blades. Someday." As you are the Dragonborn, and the Blades are sworn to protect you, you might be inclined to help Delphine find new recruits. When you offer, she will say, "If you find anyone you think would make a good recruit, I can certainly take a look at them. Remember, though, being a Blade is a lifelong commitment. Their loyalty has to be with us once they're in." You can bring two more recruits to Delphine for the oath taking. After the third, she will say "That's enough recruits for now. Ask Esbern about the dragon lairs he's been studying. We'll have the recruits do some hunting with you." Speak to Esbern to complete the quest and begin the Dragon Hunting repeatable quest. 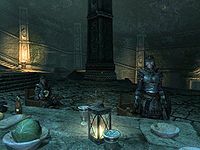 You can still ask recruited Blades to follow you, but they will be situated at Sky Haven Temple rather than their place of usual residence. If you induct your spouse into the Blades, then you can still move your spouse to a house you own. If you choose to live at your spouse's home, you will be directed to Sky Haven Temple. All permanent followers are eligible to join the Blades except Serana and those from the Dark Brotherhood. When a new recruit joins the Blades, they automatically leave your service, so a new follower can be recruited. Bugs affecting your ability to obtain new followers may be solved in this manner, though only three followers may be recruited. Hirelings that join the Blades can be hired for free after they move to the temple. If one of the new recruits dies for any reason, they cannot be replaced by inducting another follower. 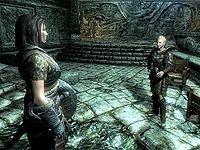 If the optional quest Paarthurnax has started, you can still recruit followers for Delphine. When it comes time to talk to Esbern however, he will not finish this quest or start the Dragon Hunting quest until Paarthurnax is slain. Blades armor is heavy armor, so recruits who do not favor that skill will be at a disadvantage. Similarly, Skyrim's Blades only have one-handed swords, so followers unskilled in One-handed may be at a disadvantage. Both of these however do not apply for essential characters. Any armor given to Blades inductees prior to their induction may be removed from their inventory. Due to this bug, it appears that dragon priest masks are also lost. This renders the quest in Bromjunaar Sanctuary impossible to complete. When dismissing Blade followers who were formerly housecarls, they will say "I will be back at your house if you need me, Thane", though they will actually return to Sky Haven Temple. Sometimes, followers recruited into the blades will travel back to where you recruited them, even though Delphine accepted them. A possible fix could be to load before recruiting the previous Blade (only possible if this wasn't the first follower you introduced to the Blades), recruit that previous Blade again and try again with your second one. Esbern may be unavailable when you try to talk to him. There is no dialogue option and he just says 'Did you say something?'. Followers may attack one another killing one of your blades members. The following empty quest stages were omitted from the table: 50. On the PC, it is possible to use the console to advance through the quest by entering setstage FreeformSkyhavenTempleA stage, where stage is the number of the stage you wish to complete. It is not possible to un-complete (i.e. go back) quest stages, but it is possible to clear all stages of the quest using resetquest FreeformSkyhavenTempleA. This page was last modified on 21 February 2019, at 21:20.